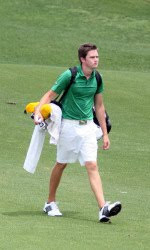 Charlotte 49ers three-time all-American Corey Nagy has advanced through stroke play and into match play at the 2009 US Amateur. Nagy posted back-to-back rounds of two-over par 72 to finish stroke play tied for 14th at +4, 144. The top 64 individuals in stroke play advance to the match play bracket. Head-to-head competition follows to determine the 2009 US Amateur champion. Charlotte freshman Andy Sajevic finished stroke play at +12, 152. He tied for 143rd in the 312-player field, landing a spot in the field's top half. Nagy had a pair of birdies and a pair of bogey's in today's second round to go along with one double bogey. Match play begins Wednesday in the 64-player bracket.